After attachment of two temperature transmitters, WLP-2 can calculate the energy transfer to the protected building. The system may be configured to force open the cutoff valve when room or return temperature drops below a certain (adjustable) limit. After attachment of two pressure transmitters, WLP-2 can perform automatic cut-off on operating pressure fault, and automatic restart when operating pressure normalizes. This avoids many nuisances on restart of the installation after distribution system repair work. WLP-2 accommodates a number of liquid sensors LS-X for extra protection of specific exposed or vulnerable locations. DanTaet protection systems may be delivered to customer specifications on request, e.g. 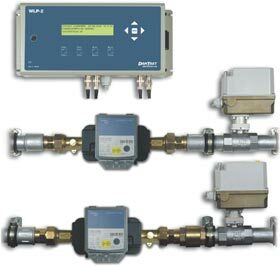 using electromagnetic or ultrasonic flow meters in lieu of mechanical meters (ill. above), or with system capacities other than those listed below.